100% Cotton. A lovely bright fabric from the Flutter ranger. 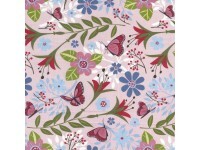 Butterflies and flowers in various colours on a pale pink background. Has another coordinating fabric on a blue background.